Ce document au format PDF 1.3 a été généré par Adobe Acrobat 7.0 / Mac OS X 10.11.2 Quartz PDFContext, et a été envoyé sur fichier-pdf.fr le 22/04/2016 à 01:21, depuis l'adresse IP 78.230.x.x. La présente page de téléchargement du fichier a été vue 450 fois. Taille du document: 5.1 Mo (14 pages). Direction of rotation . . . . . . . . . . . . . . . . . . . . . . . . . . . . . . . . . . . . . . . . Checking . . . . . . . . . . . . . . . . . . . . . . . . . . . . . . . . . . . . . . . . . . . . . . . Setting . . . . . . . . . . . . . . . . . . . . . . . . . . . . . . . . . . . . . . . . . . . . . . . . . Transfer fuel pump pressure . . . . . . . . . . . . . . . . . . . . . . . . . . . . . . . . . . Accelerator pedal/position sensor . . . .
Air conditioning compressor bracket . .
Air conditioning compressor . . . . . . . . . Charge pressure sensor . . . . . . . . . . . .
Coolant temperature sensor . . . . . . . . . Crankshaft sensor . . . . . . . . . . . . . . . . .
Electronic control unit . . . . . . . . . . . . . . Exhaust front pipe-to-turbocharger nuts . . . . . . . . . . . . . . . . . . . . . . . . Retaining nuts and bolts . . . . . . . . . . . . . . . . . . . . . . . . . . . . . . . . . . .
Support bracket bolts . . . . . . . . . . . . . . . . . . . . . . . . . . . . . . . . . . . . .
Fuelinjectors . . . . . . . . . . . . . . . . . . . . . . . . . . . . . . . . . . . . . . . . . . . . .
Fuelpipeunionnuts . . . . . . . . . . . . . . . . . . . . . . . . . . . . . . . . . . . . . . . .
Fueltank . . . . . . . . . . . . . . . . . . . . . . . . . . . . . . . . . . . . . . . . . . . . . . . . .
Central bleed screw . . . . . . . . . . . . . . . . . . . . . . . . . . . . . . . . . . . . . .
Pump bracket to cylinder block . . . . . . . . . . . . . . . . . . . . . . . . . . . . .
Pump to pump bracket . . . . . . . . . . . . . . . . . . . . . . . . . . . . . . . . . . . .
Pumptotimingcover . . . . . . . . . . . . . . . . . . . . . . . . . . . . . . . . . . . . . Timing belt sprocket nut . . . . . . . . . . . . . . . . . . . . . . . . . . . . . . . . . . .
inlet manifold nuts and bolts* . . . . . . . . . . . . . . . . . . . . . . . . . . . . . . . . .
Oilpressureswitch . . . . . . . . . . . . . . . . . . . . . . . . . . . . . . . . . . . . . . . . .
Oil return line banjo . . . . . . . . . . . . . . . . . . . . . . . . . . . . . . . . . . . . . . . . .
Exhaustflangenuts . . . . . . . . . . . . . . . . . . . . . . . . . . . . . . . . . . . . . .
Oil feed line adaptor to block . . . . . . . . . . . . . . . . . . . . . . . . . . . . . . .
Oil feed line to turbocharger/block adaptor . . . . . . . . . . . . . . . . . . . .
Turbocharger-to-manifold nuts . . . . . . . . . . . . . . . . . . . . . . . . . . . . . .
pump, and is then returned to the tank. the ECUs of the accelerator pedal position. passing through the intake ducf. engine speed and crankshaft position. 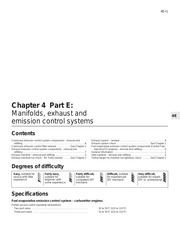 of the pressure in the inlet manifold. the ECUs of the atmospheric pressure. ECUs of the fuel temperature. 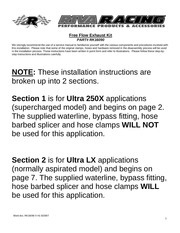 pump return hose by leak-off pipes. to the increased air intake. turbocharger comes from the exhaust gas. (with either a hot or cold engine), warm-up, inlet air on the way to the inlet manifold. 7 The engine ECU also controls the exhaust gained in being compressed from the inlet air. heat further increases engine efficiency. and the pre-heating system (see Chapter 5C). drain pipe returns the oil to the sump. controlled by the ECU via a solenoid valve. located behind the centre of the facia. air cleaner cover (see illustrations). mass airflow meter from the air cleaner cover. 4 Lift out the element (see illustration). of the air cleaner (see illustration). (where necessary) bolts have been slackened. and their retaining clips securely tightened. dealer reprogram the volatile memories. necessary, pull back the footwell carpet first. withdraw the sensor from the bulkhead. operation, for a maximum of 40 seconds. should idle smoothly at a constant speed. possible when carrying out this procedure. to Disconnectingthe battery at the end of this similar tool, to depress the retaining tangs. 2 Syphon out any remaining fuel in the tank prevent dirt ingress and further fuel spillage. container which can be sealed. the locking clips release (see illustration). 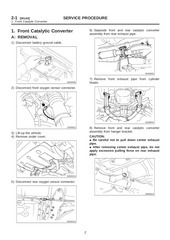 cover to expose the fuel gauge sender cover and hose connections (see illustration). 5 Identify the position of the fuel feed and bottom of the cover (see illustration). fittings. Be prepared for some loss of fuel. A supply hose from the cover (see illustration). fuel line connectors (see illustration), but withdraw the cover. released using a pair of long-nosed pliers, or a - illustration). away from the fuel tank. provide greater clearance (refer to Section 16). sensor, at the connector on the underbody. bottom of the fuel tank. filler hose from the fuel tank. jack with interposed block of wood. straps from the fuel tank. removed from under the vehicle. prevent entry of dust and dirt. renewed at the same time. to remove all contamination from the tank. repair to a fuel tank. as described in Chapter 9.
to test and adjust the settings. towards the air cleaner (see illustration). cylinder block, beneath the starter motor. the wiring plug from the sensor. retaining bolt to the specified torque. plug from the sensor (see illustration). housing. Mop up any spilled coolant. 12 Reconnect the wiring plug to the sensor. battery tray as described in Chapter 5A. and position to one side. threads, and screw the switch into place. Tighten the switch to the specified torque. battery tray and battery where removed. 27 Start the vehicle and check for oil leaks. 30 Disconnect the wiring plugs from the ECU. 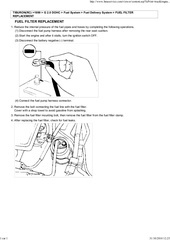 using two screwdrivers (see illustrations). bracket from the top of the ECU. remove the ECU from the mounting bracket. nut, and remove the ECU mounting bracket. the right-hand rear end of the inlet manifold. hose from above the inlet manifold. as described in Part D of this Chapter. dealer program all volatile memories. top of the injection pump. 44 Reconnect the wiring plug. prior to any attempt to remove the sensor. the engine, beneath the injection pump. Access is best from beneath the vehicle. the fuel injection pump at the flywheel end. of the fuel injection pump, at the flywheel end. sprocket as described in Chapter 2C. are unlocked by lifting up the metal levers. clips and remove the centre charge air hose. the centre charge air metal pipe. 9 Disconnect the wiring from the glow plugs. valve as described in Part D of this Chapter. return line from the oil filter housing. the injection pump (see illustration). the cylinder head. Recover the gaskets. hoses from the injection pump. routing of the various wiring looms. 22 Unbolt the mounting bracket from the lefthand end of the pump (see illustration). between the pump and cylinder block. tighten the banjo bolt securely. oil return line and hose. 34 Refit the engine lifting eye. 36 Reconnect the wiring to the glow plugs. the pump. Be prepared for fluid spillage. 39 Refit the injector lines and clamps. 41 Refit the engine electronic control unit illustration).Recover the seal. purchased from most good motor factors. 43 Reconnect the wiring plugs to the ECU. and lower the vehicle to the ground. cylinder at TDC on its compression stroke). operations in paragraphs 8 to 10.
it to the specified torque. cooler housing and retaining bolt (if removed). from the disturbed pipes and unions. dealer or fuel injection specialist. mount them in a bench vice. remove the injector clamps (see illustration). 5 Lift the injectors out of the cylinder head. washers and rubber seals to each injector. nuts to the specified torque. injector, and the underside of each bolt. 12 Restart the engine and check for leaks. from the manifold (see illustration). turbocharger heat shield (see illustration). 10 Unbolt the rear engine lifting eye. clamp and remove the charge pressure sensor. 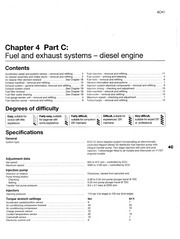 (ECU) as described in Section 8.
turbocharger and withdraw from the engine. the centre air pipe from the inlet manifold. 7 Disconnect the wiring from the glow plugs. gasket faces, and fit a new gasket(s) in place. a dealer reprogram the volatile memories. Vauxhall dealer for testing and examination. be overhauled or will need renewing. lower part of the radiator. the intercooler frorn the front of the radiator. axle stands (see Jacking and vehicle support). supports on the tube (see illustrations). belt is refitted the same way around. hose from the pump and block. permanent damage to the flexible section. the front of the exhaust pipe to one side. mounting bracket bolt (see illustration). 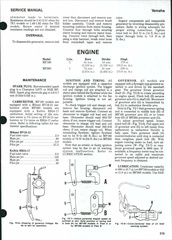 turbocharger oil return hose (see illustration). oil feed line union on the block (see illustration). and remove the air intake pipe. bolts, and move the compressor to one side. bracket and guide tube (see illustration). remove the centre charge air pipe. turbocharger and recover the seals. the turbocharger as described in Section 12.
bolts to their specified torques, where given. component is obtained (see illustration). to the flexible section. Recover the gasket. Ce fichier a été mis en ligne par un utilisateur du site. Identifiant unique du document: 00418981.